Kawagoe Matsuri (川越祭り) is one of the popular Dashi Matsuri in Kanto Region. Dashi is Japanese parade float and, in this Matsuri, many Dashi parade all over Kurazukuri which is the main avenue with lots of Edo Style building. Each towns have their own Dashi. On the top of Dashi there are doll of Japanese famous Heros. When those heros meet other heros, they start fighting. This fighting is the main feature of Kawagoe Matsuri, called Hikkawase. They compete others by making bigger sound with voice, drums, bells and flutes. This Matsuri has been going on over 360 years. This Matsuri happens in the middle of October and is held for two days. Just like other typical Matsuri, there are many food stands opens. Roads will be closed for the festival. Dashi has three levels. Lower level is where musicians and dancers perform. Middle level, also the roof of the lower level is where the driver of Dashi stays. Upper level is the doll of hero placed. Middle and Upper level can be stored inside of lower level. The hight of Dashi is about 8m high, 3m wide and 4.4m deep. There are about 30 Dashi in Kawagoe. 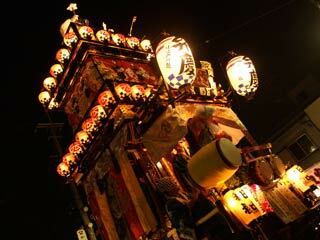 Matsuri goes for two days and have parade for noon and night. Kawagoe Matsuri was started in 1648 as Matsuri of Hikawa Shrine. In 1844, Dashi parade became the main feature of Kawagoe Matsuri.